If you have minor aches and pains from everyday activities, exercise, arthritis or other causes, check out Zim’s Max Freeze Patches for temporary relief for your muscles and joints. Zim’s Max-Freeze line-up offers products can also help with pain from simple back aches, strains, bruises and sprains. Be sure and read what It’s Free at Last thought about the Zim’s Max Freeze Patches in their full review here! 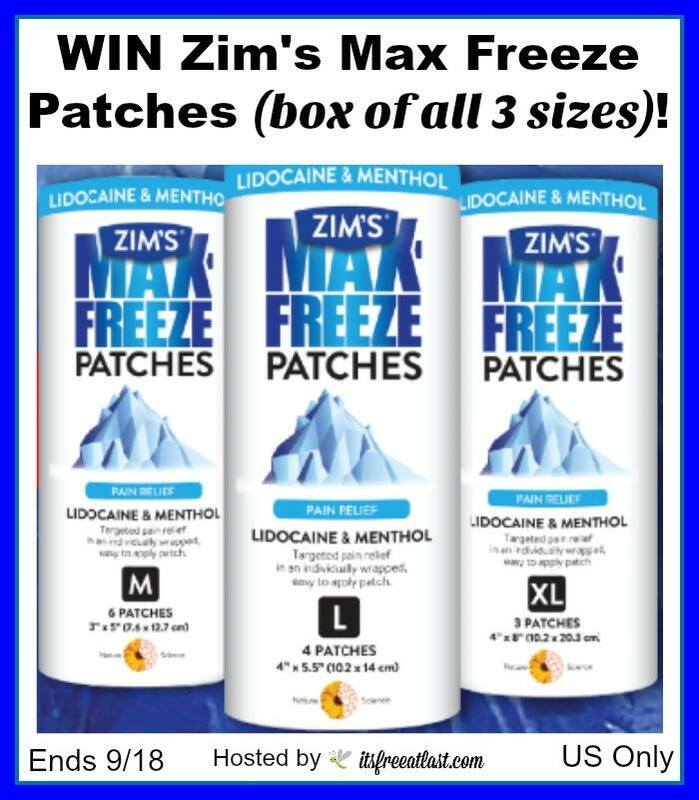 One lucky reader will win a box of Zim’s Max Freeze Patches in all 3 sizes! Giveaway ends 9/18/16 at 11:59 pm ET! Open to US residents 18+ and older. I have problems with my back. I could really use these to help. My neck and shoulders are always so tight and achy. My husband and I have lower back pain. I feel it is the worse! I have upper back pain at times. I have fibromyalgia so I hurt all the time just in different places. between my arthritis knees, and lower back its a toss up which is the worse on any given day, throw in my arthritis in my hands when they flare up..
My worst pain is the lower back pain that I experience after at get home from work in the evening and during the night when I am trying to sleep. I have joint pain in my left knee , child hood ski accident, cracked my patella. back pain is my worst and my wives for sure. My worst pain is in my mouth and my tongue. These patches probably can’t help me with that, but they’d be great for my shoulder pain! My worst kind of pain is in my knees which have very little cartilage left and are almost bone on bone. I would like to find some pain relief besides taking medicine that causes side effects. my lower back which was broken and the lymphedema in my legs. Back pain is the worst for me. My hips, I can’t sleep at times it gets so bad. It’s actually not me, but my Mother. She suffers with rheumatoid arthritis, osteoarthritis, fibromyalgia, degenerative disc disease. She used to be able to get lidocaine patches but now her insurance will not approve to pay for them and there is no way she can afford it. She has pain in her joints, back and right knee. My back, arms and legs ache from fibromyalgia, I’m betting these would be a great help for that, and a great plus is they’re not narcotic or medication to make me drowsy.